If you are physiotherapist or doctor, you will often find been asked, “oh, how do you treat problem XYZ?”, and are expected to say, “we give this” or “we use this technique”. Sometimes, this ABC approach works fine but occasionally it doesn’t as Dr Eric Topol will attest to in his article, “A doctor with a bad knee runs into one-size-fits-all medicine“. But do we really, as consumers, appreciate what it means to get individualised medicine? Can we tell the difference? How do we as laymen challenge or test the ‘experts’? By individualised, we take it to mean ‘just for me’. When we walk into a physiotherapy clinic, and after a one or two questions, we get a diagnosis. It sounds specific especially if it is jargon-filled. But if all the clinician asked was a few questions, it is more likely the condition simply matched a common set of symptoms. We don’t ask about how many others have the same problem. Usually, this ‘most likely problem’ approach works well enough until it doesn’t. It didn’t eliminate the other conditions/diagnoses that also with the same set of symptoms (with a few more that were not explored). What most likely happened here is that the therapist has jumped to a conclusion, and is now finding “symptoms” or “data” to fit into his or her theory. 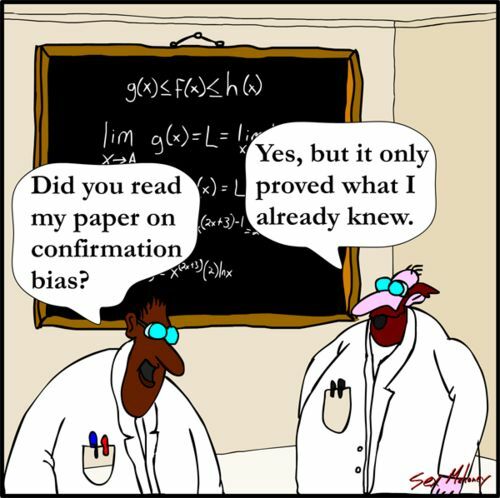 This is known as “confirmation bias“. The ratio of questions to answer is often a good gauge of the amount of thinking going on behind the scene. If in doubt ask them why do they think it is condition XYZ. Unsurprising after that, you might think that if not asking or gathering enough information is bad, then more information must be good then and mean more thinking! We are today in a world enamoured with data. More data is better. Better, faster gene sequencing and more test results, we will solve everything. The another tactic to simulate thinking is to take a lot of measurements or order a lot of tests like MRIs and X-Rays. These, in fact, are very poor substitutes for thinking. Your therapist should not be hoping for your MRI result to reveal the problem. Tests like MRI and X-rays should instead be used to confirm or clear assumptions and hypothesis he has about your condition. Unfortunately, like the “Big Data” industry it hides a dirty secret. With “big data” explosion, our ability to gather and amass data is not matched by our ability to make sense of it. As if with more data, the answers will reveal themselves to us. The tremendous amount of information generated by fancy tests and scans is stymied by the simplest of questions, “so what?“. We need to place more emphasis on the other ‘lever’ – “the ability to think”. “Thinking Physiotherapist” has been a key part of Core Concepts since the beginning. “Thinking” is almost a mantra within our organisation. If your therapist says, “it will get worse better it gets better”, you should perk up and pay closer attention. This or the “no-pain-no-gain” tactic is sometimes true, but often it is used a convenient escape clause for cluelessness. Sometimes, it does need to get worse before you can eliminate or confirm a diagnosis. BUT it must be part of the plan. For example, when you need to confirm between two very likely causes of the problem, so you need to choose a path. If you pick the wrong path to start with, then when nothing changes (at best) or gets worse, you know that the other path was the right. And not simply press through (as it happened to Dr Eric Topol in the article earlier). As consumers, we need to better understand and appreciate the process of how our therapist arrive at their conclusion and rationale for their treatment approach. Prod and test your therapists back!